[CDU ESL 연예뉴스 잉글리시 스캔들] '비율왕' 김지훈, 얼굴이 주먹만해? 배우 김지훈(사진)의 주먹만한 얼굴 크기가 화제다. 최근 인터넷 커뮤니티 게시판에는 ‘김지훈 주먹만한 얼굴 비율 속 빛나는 외모’라는 글과함께 SBS ‘결혼의 여신’ 촬영현장이 게재됐다. 관계자는 “김지훈의 주먹만한 얼굴은 촬영장에서도 단연 돋보이는 존재다”라며 “요즘 ‘결혼의 여신’ 강태욱역할을 맡아 바쁜 나날을 보내고 있는 그의 얼굴에서는 단연 미소가 떠나지 않는다”고 전했다. 이 사진을 본 네티즌들은 “김지훈 얼굴 사이즈 부럽다” “주먹만한 얼굴이 있긴 있구나” “재벌남다운 카리스마 좋아요” “김지훈 요즘 매력 넘치는 듯” “갈수록 동안 미남” 라는 반응을 보였다. 한편, 김지훈은 ‘결혼의 여신’에서 강태욱 역을 맡아 완벽한 재벌남 연기를 선보이고 있다. The size of the face of the actor Kim Ji Hoon’s becomes a controversial issue. A filming spot of SBS ’Goddess of Wedding’ was posted with a title ’Kim Ji Hoon, Shining appearance with a face like a fist’ on an internet community board lately. One person concerned said "Kim Ji Hoon’s face which is like a fist stands out in a filming spot. He’s leading a very busy life as performing a role of Kang Tae Wook ’Goddess of Wedding’ and he always smiles." Netizens who saw this picture reacted like "I envy his face size." "There’s a face like a fist." "I like the charisma that is like a plutocrat." "He’s stardacious these days." "He’s getting handsome with a baby face as days go by." 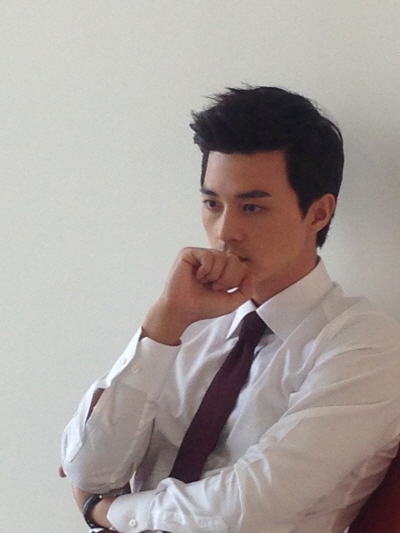 Meanwhile, Kim Ji Hoon is performing a perfect plutocrat acting as Kang Tae Wook.